He’s finished! He comes in at exactly 10″ long. Teeny! The patterning on the shell made him a little more box turtle-y and less sea turtle-y, but I can live with that. His name is Fred and I may just have to keep him, he’s so cute. Eyes were made out of the dreaded Microspun. The gauge is really tight to avoid having stuffing pop out. The yarns all call for US 5-6 needles; I was knitting on US 1s. That made it a little hard on the hands. I think I would have been ok on US 2s, but needed to go down to 1s to get gauge. Since when am I worried about gauge? Especially for a toy? I think if I made it again, I’d use the 2s. Time to cast on for something new! 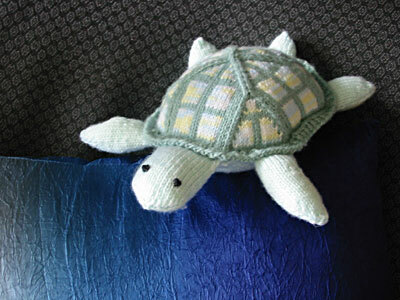 CogKnition posted this on May 9th, 2006 @ 1:57pm in Finished Objects, Toys | Permalink to "Wins the Race"
What an adorable turtle! So cute! The size 1 needles don’t sound like much fun though! Mostly it was an issue because the needles were about the same thickness as the yarn. I’m about to cast on for some lace using those same needles; hopefully it’ll be better. Knitting the turtle made the back of my left hand hurt all over. Oh, he’s adorable! I love his shell.